I start the week with a dawn stroll along Lower Albert Road, where I encounter our bow-tied Chief Secretary Donald Tsang. The devout Catholic informs me that he has just been to church, as he does every morning. “Let me guess,” I ask him, “you beseeched the Almighty to help you push through the plans for the West Kowloon cultural hub against overwhelming public opposition, and deliver the project, with its billions of dollars in profit, into the rapacious hands of Mr Li Ka-shing.” He nods quietly, adding that of course he also prayed for the health of our Holy Father the Pope. “Cynics will accuse me of acting out of self-interest,” he laments, wringing his hands, “but what choice do I have, in all conscience? If I can ensure that Mr Li’s consortium wins this project and covers the site with luxury apartments, he might let me be the next Chief Executive after Tung Chee-hwa.” He looks at me sadly. “Otherwise Henry Tang could get the job.” I nod sympathetically. Only divine intervention can save us from another eight years of rule by dim-witted tycoons. If God anoints Donald we have hope. I am moved by the selflessness and courage that enable this unassuming and dedicated public servant to sacrifice 100 acres of publicly owned land in order that he personally might assume the dreadful burden of preserving our city from continued plutocratic despotism. I run up to the church to chuck in a few Hail Mary’s of my own. A new life-enhancing feature comes to the Mid-Levels in the form of a 7-Eleven so close to the escalator in Soho that if it were nearer it would commute down the hill into Central. This morning I inspect the premises, formerly a dusty chinaware store, and find that despite its small size, it offers almost anything Hong Kong’s hard-working middle class could possibly want in an emergency. Newspapers, durian-flavoured condoms, noodles and dumplings for the microwave, refrigerators full of fine ales, and a surprising choice of magazines about people in absurd clothes hitting little balls with sticks. I will soon have the serving staff trained to throw me my newspapers as I glide down in the morning, and a six pack of San Miguel on my way home. It will be the modern equivalent of the old street vendors who used a sling to hurl goods into apartment windows. Despite this wondrous new convenience, the mood is sullen as my neighbours and I glide down the electric ladder towards our offices. Sesame Street today was brought to you by the word ‘cronyism’. Everywhere we look – from the West Kowloon cultural hub to the Hunghom Peninsula – we see the Government transferring our hard-earned wealth to a small handful of tycoons. A marketing manager, shaking mothballs out of her fur coat, wonders whether things weren’t just as bad under the British. Didn’t Swire lobby against the building of a new airport all those years ago, to keep Cathay Pacific’s stranglehold at Kai Tak? I give her one of my hard stares. “It’s different today,” I tell her, recalling a HK Democratic Foundation paper from over four years ago. “Were colonial governors in business here before taking office? Did they sit on local boards, like Tung did with Sally Aw? Were tycoons and officials linked through family ties, marriage and business deals? Did colonial officials hang around and go into business after they retired?” A banker acquaintance of ours turns to join the conversation. Beijing chose Tung precisely because he’s so detached from the local business scene, he reminds us. The family is from Zhejiang, and the crop-haired one only came here when he was 10, and then spent much of his earlier life in the UK and the US. We look at one another in silence. So this isn’t cronyism. Cronyism is what we would have if the local Canto-rabble were allowed to run this place. What a relief. It is one thing to wake up in the middle of the night to find a damp patch on my pillow where I have dribbled. I blame gorgonzola, a late-night snack of which usually triggers my recurring dream about women police officers smearing themselves with congee. It is something else altogether to flick through unread parts of yesterday’s paper in my office this morning and look down to find that I am drooling saliva all over my computer keyboard. I pinch myself to make sure this is not another cheese-fuelled reverie, but no – I am awake. 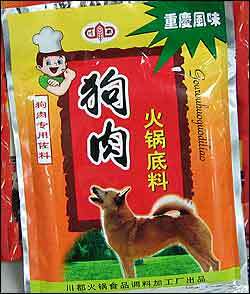 And I am indebted to the gastronomes of the Animals Asia Foundation for alerting food lovers to the fact that after a two-year hiatus, Park n Shop outlets in Shenzhen are once again selling ‘fragrant meat’ – the favourite winter dish of all right-thinking people. My preferred method of preparation involves kimchi, peppers and cucumbers, though the highly adaptable ingredient can be used to produce a wide variety of culinary delights. The best thing is that by consuming this succulent flesh, we enjoy a nutritious and tasty meal while removing members of an otherwise noisome life form from our midst, thus making the world a better place – something we can’t achieve by eating, say, a banana. Two memories come back to me. One is of a time when I never wanted to go to bed early, but would have been made to do so for eating chocolate for dinner or scribbling in a book. The other is of the time I could have thrown Chuck Colson under a bus. It was 10 or more years ago at the junction of Glenealy and Wyndham Street, just up from the Foreign Correspondents Club. I thought the ugly, fat, thick-lipped oaf standing next to me waiting to cross the road looked familiar – in fact, looked like a particular Watergate felon. And the next morning I read that, indeed, Colson – long out of prison – was visiting Hong Kong as part of some born-again Christian mission. Not that I have any regrets about this missed opportunity. It would have been too late to change the course of history, and the traffic on Hollywood Road was congested enough. The South China Morning Post goes into hideously embarrassing shoe-shining overdrive this morning, lauding Mainland company Lenovo’s purchase of IBM’s barely profitable PC-manufacturing business as an example of the glorious motherland’s inexorable rise to greatness. ‘Bite of Big Blue puts Lenovo in big league’, gushes the lead headline on page 1. The big league in what? Bolting together commodity consumer goods that are as cutting-edge as toasters, albeit more irritating. It’s the mergers and acquisitions equivalent of putting a man into orbit four decades after anyone stupid enough to squander money on such nationalistic PR gimmicks had already done so. While the Chinese firm struts around thinking it’s clever in its overpriced gwailo hand-me-downs, IBM strides into the high value-added future of rip-off software and extortionate-but-mission-critical after-sales service. In a sure sign that the Christmas news famine is fast approaching, an old, lame story reappears. According to the HK General Chamber of Commerce, Hong Kong’s poor English threatens our economy by compelling foreign businessmen to locate their operations – without which we will surely starve – to Shanghai, the city where the language of Shakespeare trips naturally and mellifluously from every inhabitant’s tongue. If I were cruel, spiteful and untouched by festive spirit, I would be tempted to point out that the General Chamber is a fine one to talk, given its strange policy of consistently hiring economists who have no qualifications in the dismal science. I could then cleverly add that this doesn’t seem to prevent these non-economist economists from pontificating about the local business environment – much as citizens of the Big Lychee manage to find ways to communicate with blubbery, monolingual Westerners. But I won’t. There are so many reasons to spread sweetness and joy. For example – although weak English has nothing to do with it – corporate riffraff is indeed leaving the Fragrant Harbour for the old Whore of the Orient. 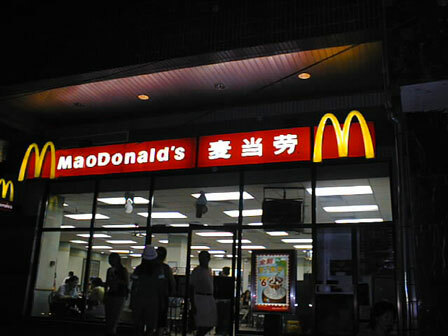 McDonald’s, with a quarter of the world’s population still to poison, is finally relieving us of its unwholesome presence and setting up its China HQ in... China. The real China. The China of Internet censorship, lawlessness, untrammeled corruption, HIV-contaminated blood, and malodorous peasants whose purchasing power might stretch to a Big Mac a week one day. Checking the Hong Kong Government’s website, I am delighted to see that our investment promotion department has already issued a press release wishing this repulsive company good riddance.